Bee Friendly Honey seeks to provide great customer service and a local honey source for our community! We are a small, local business, born and raised in Lafayette, California. Our main goal is to spread awareness of what we do and why beekeeping and pollinator health are vital to the health of our environment. We also work with clients, educating them in the diversification of their yards for natural pollinators, thereby helping the environment and emphasizing sustainable and eco-friendly landscaping. Our practices promote local biodiversity and sustainable ethics. We recycle swarms of wild bees into our own hives, and feed the wasps collected in hive removals to chickens and fish on property in the Gold Country. Future plans include the creation of a sustainable farm that produces solely pollinator-friendly flora, protects bees, and gives back to the environment. Ever since I was a young boy I can remember lifting up stones, wood logs, bricks, pavers, anything that might conceal some type of bug or animal. As I grew older, my room became filled with terrariums and aquariums that brought the natural world I so craved right inside my home: the glass enclosures teemed with sound and life, sharing secrets that only the most observant entomologist could decipher. I grew up, wondering if there was ever going to be a way for me to keep learning from the most wonderful teacher I'd ever had, nature herself. Nature also inspired me to experiment with plants, and I ended up developing a green thumb nursing plants back to life and growing new and exotic ones from seeds and cuttings. This is when I decided to attend Cal Poly State University, to study plants and flowers that grew with the vigor of my imagination. Then one day working in the flowers, I saw a honey bee, and my eyes lit up as I realized I had finally found a way to follow my heart, and be one with the bees..
Steven majored in Agricultural Environmental Plant Sciences, with a concentration in Greenhouse Nursery Plant Production. His coursework included classes in sustainability, environmental sciences, irrigation of crops and water fluidity dynamics, pest management, beekeeping, botany, soil sciences, water tables and behavior, and water in our environment relating to aquifers. He is trained to look at an ecosystem critically, and is aware of favorable conditions and places where bees should be located (or not) due to environmental or man made factors. I hope Bee Friendly Honey can help you in your time of need! Hear what our past customers had to say about their experience. 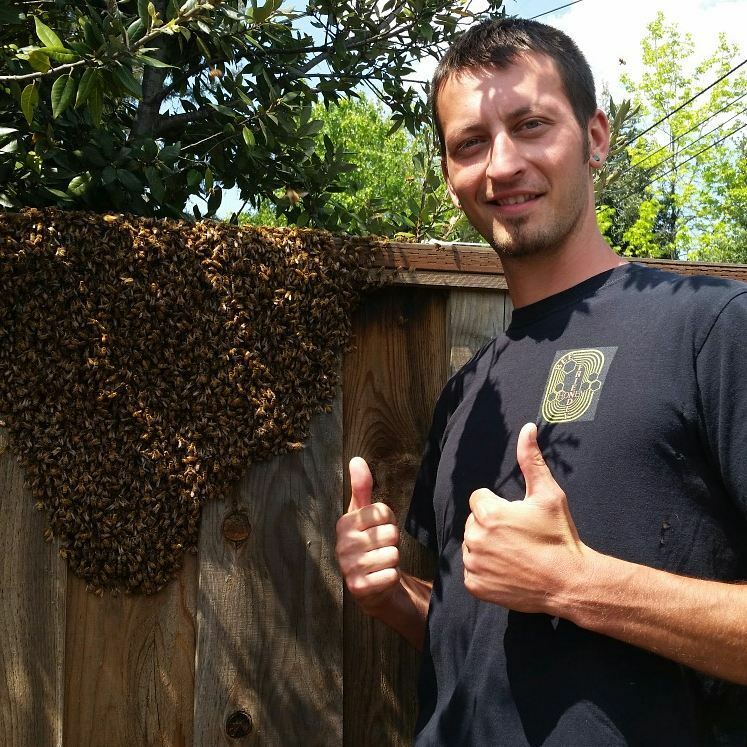 Lafayette, California based Bee Friendly Honey is the best place to have a honey bee swarm collected from your yard or hive carefully removed from your property without hurting any of the bees. We also remove unwanted wasps and hornet nest. Call for a free estimate! Bee Friendly Honey offers a physical hive removal service! Steve is fully licensed and bonded, and we are entirely pesticide free. We offer a sustainable and ecologically sound way to remove pests from unwanted places: hives of removed honey bees are relocated to our apiaries that are located in the Bay Area and the foothills of the Sierras, primarily Angel's Camp and Murphys. Hives are always removed completely: we never spray and leave the hive as is, as decaying hives and their inhabitants can attract rodents and ants who go after the honey or the larvae. Simply plugging up a hole in the wall in front of the hive will do little good---insects are crafty, and can find alternative ways into your living space! If you’re dealing with a hive, give us a call! We are local and community focused, NOT a large pest control company! We care about the quality of services provided, and are happy to answer any questions you might have. We can usually schedule you within the week that you call. Details on each type of hive removal are below---call us for a price estimate, or with any questions! Bee Friendly Honey produces a great tasting honey in several floral notes and pollen harvested fresh from the hive. Our products are 100% LOCAL, PURE, RAW and UNFILTERED.